Lost Your Joy? How To Find Your Happy! 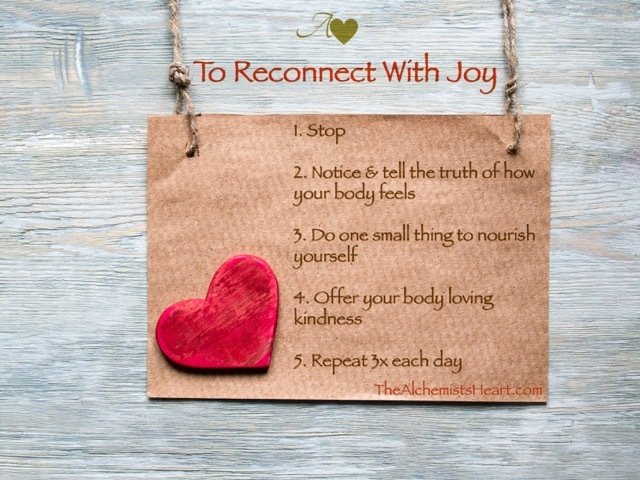 It’s time to reconnect with joy! YOU belong. YOU are important. YOU touch the lives of people around you in ways you can’t begin to imagine. YOU are a force for good, a node of Divine connectivity enriching our greater experience, and I LOVE YOU. You and I are among the amazing souls showing up and caring deeply about ways to create alchemy in your lives…but we aren’t necessarily embodying this knowledge. Too many bright spirits are sharing a feeling of being profoundly isolated…like they just don’t belong anywhere in this world. Are you feeling overly busy these days? Are you exhausted from taking care of everyone else? Do you secretly long to stay in bed, pull the covers over your head and sleep for a week? Do you wish that someone would show up and take care of you for once? You’re competent, smart, and a hard worker. The problem is, you have been so busy taking care of other people — your kids, your customers, your partner, your friends, other family members — right now, you’re barely holding everything together. You’re a tough cookie. But you can sense the light inside of you getting dimmer and dimmer. You’re too young to feel this old. I see you, beauty. And know this: There is another way. Do not drop anchor here. The world does not need you to use yourself up until you are as empty as an old tube of toothpaste. Your exhaustion is actually an invitation from the goddess Aphrodite herself. She is calling you to discover a new way. A better way. A way you can care deeply and well for the people you love… and have way more energy, peace and support than you have now. 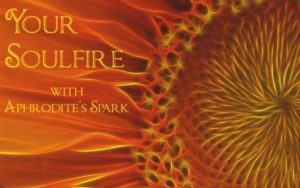 Prepare to explore true sexiness, awaken your inner healer, clear out trauma and reconnect with your authentic self in this power hour on inviting Aphrodite energy – the alchemy of self-love and soul nourishment – on The Alchemist’s Heart Podcast! Join soul connector, holistic physical therapist and intuitive healer, Michelle Alva as she unites modern movement science with ancient wisdom to create easy, effective and FUN ways to feel fulfilled, empowered and connected to our body-mind-soul! 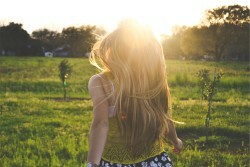 Are you ready to reconnect with your Inner Goddess, step through your perceived fears and embrace the truth of who you really are? 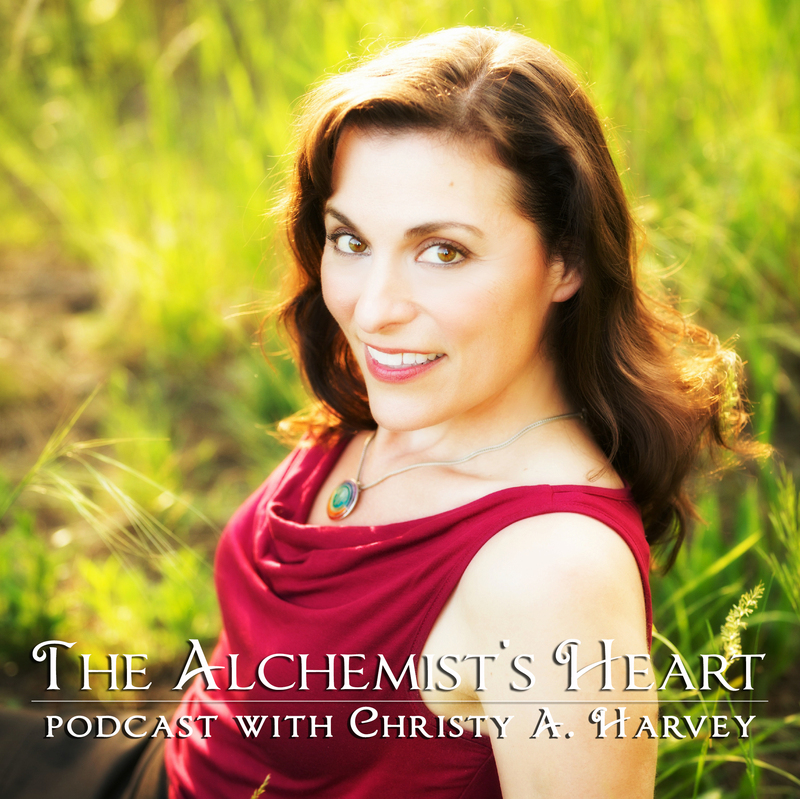 Now you can learn the secrets to tapping into your full feminine power on The Alchemist’s Heart Podcast! 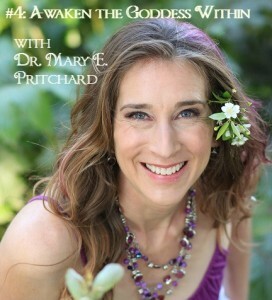 Join up with psychologist and Body Love Expert Dr. Mary Pritchard, international bestselling author and founder of the Awakening the Goddess Within virtual community as we share ways to help heal our relationships with food, our bodies and our authentic selves! 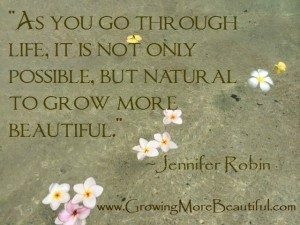 Learn the surprising secrets of growing more beautiful and embracing your inner Goddess with alchemist Jennifer Robin on The Alchemist’s Heart Podcast! Jennifer is the author of a gorgeous award-winning book, Growing More Beautiful: An Artful Approach to Personal Style. Her earlier writing, Clothe Your Spirit: Dressing for Self Expression, launched a twenty-five year career as an image consultant, makeup artist and fashion stylist. Recognized for her innovative use of color and design, she is also a gifted visual artist and exhibiting painter. Jennifer combines her consultant’s expertise with her artist’s understanding that an authentic inner life is a deep, rich source of beauty. Alchemist and guest blogger Jennifer Robin gifts with this final installment of her exclusive Growing More Beautiful series. Read on to enrich your life now! As we grow older, our relationship to our appearance becomes both more challenging and more interesting. Our choices become more pronounced. Being aware of the passage of time heightens our relationship to the present. 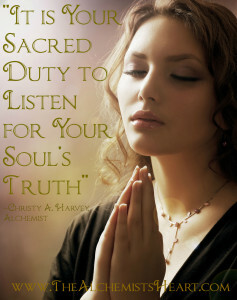 You need to continue to ask yourself: What is authentically beautiful to me? What do I value? What is a realistic use of my time and resources? Beauty is always about making choices, and aging puts those choices into sharper relief. 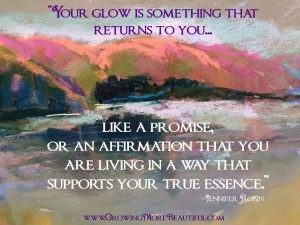 Did you catch the sumptuous writing in Jennifer Robin’s first guest post on the alchemy of growing more beautiful? Jennifer is an alchemist, image consultant, makeup artist and fashion stylist and painter who is gifting us now with part two of her Growing More Beautiful series. Read on to experience her alchemy with the evocative power of color! 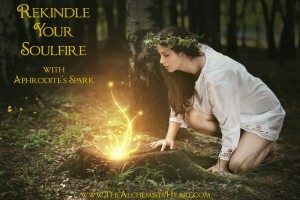 This proven method of inviting Aphrodite by connecting with your inner Goddess is available to you now! 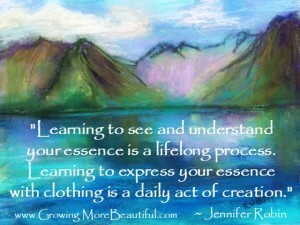 I am delighted to have discovered alchemist Jennifer Robin and her gorgeous (really & truly!) 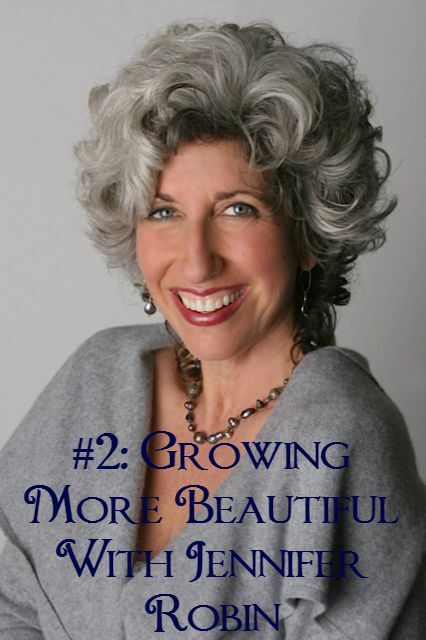 award winning book, Growing More Beautiful: An Artful Approach to Personal Style. Her earlier writing, Clothe Your Spirit: Dressing for Self Expression, launched a twenty-five year career as an image consultant, makeup artist and fashion stylist. Recognized for her innovative use of color and design, she is also a gifted visual artist and exhibiting painter. Jennifer combines her consultant’s expertise with her artist’s understanding that an authentic inner life is a deep, rich source of beauty. Here is the first of the three-part series Jennifer has generously written exclusively for us! Ahhh, one of my favorite things just happened. I’ve been inspired once again by my readers. I outed myself on Inviting Aphrodite about some challenging events and was invited to share what I’m doing for my own self-care while I’m getting through. My first thought was to start laughing hysterically, because I always feel like there is MORE I can be doing in order to dance my talk, so to speak. But I settled down and started thinking about the details, realizing there is quite a lot I do to invite the self-love energy of Aphrodite during times that test my spirit. Have you given yourself the pleasure? If not, the time is now. 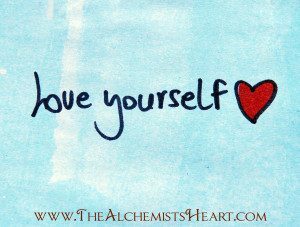 Give yourself the gift of my top 15 tips for bringing alchemy into your life by finding and wooing your inner Goddess so you can thrive! Here are the final 5 tips (for now – you know there’s always more) to enhance your relationship with your inner Goddess and allow you to shine. Catch parts one and two, then soak up some of more tips and quotes to bring out your natural glow! WARNING: These steps are challenging, but HIGHLY effective. IF you do these, I can absolutely guarantee results in your life.